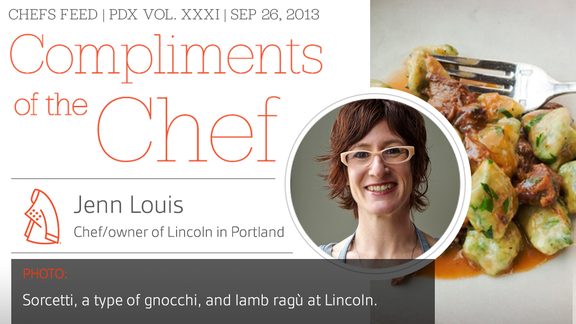 This week, Chefs Feed met up with renowned chef Louis at her restaurant, Lincoln, in North Portland. CF: I'm best known for my _______ style of cooking but I can make one hell of a _______. CF: A few words your sous chef would use to describe you. JL: Focused, intense, and probably the funniest person he has ever met. CF: What are you most excited about right now in your restaurant? JL: I am in the process of editing my book on gnocchi and Italian dumplings. This is the first English-written book on the topic, and I had an amazing time both researching and writing it. There are 65 dumpling recipes catalogued; some are really unique and all are so delicious! I'm also hosting gnocchi tastings at Lincoln as I test recipes for the new book. The tasting consists of three half portions of regional gnocchi for $25. They can range from gnocchi ricci to a la Romana to sorcetti, but they all vary depending on my daily experiments. CF: Which chef would you drop everything to stage with? JL: Any Italian grandmother in Italy (or anywhere else). CF: Insider tip from the kitchen for diners. JL: Well-prepared food is delicious. A lot of us grew up with low-quality or poorly made foods, like bad canned beets or overcooked pork chops. When a good product is cooked properly, it is delicious! Try dishes and ingredients you think you do not like; you may just add something new to your "I love" list! CF: Message to professional food critics. JL: I always teach my line cooks to taste food not with the idea of “I like it” or “I don’t like it,” but rather for quality and balance. Is it a well-executed dish? Is it a creative pairing that is rooted in something that should be understood further? Is it the next big thing, or is it simply lovely? If a dish isn’t understood, ask about it. Perhaps it is intended to be a certain way for a reason. CF: One piece of advice for aspiring young chefs. JL: Work hard—really, really hard. Do everything you do at work with craftsmanship. CF: Is there anything you don't like? CF: Thick or thin patty? JL: I can't decide. I love an old-school, thin patty for its simplicity. It is less serious and usually smaller in size. I also love a thick patty, but not too big (around six ounces is perfect for me) since I love to eat a big pile of crispy fries, too. CF: What's your go-to shift drink? JL: It depends on the day, but it is mostly just bourbon either straight up or on the rocks. I rarely drink cocktails. CF: What's for family meal tonight? JL: Happy family albóndigas: chicken, beef, and pork meatballs with a chili-tomato broth and tortillas.